The Swipe card reader is a lightweight and low cost solution for stores that are mobile. The card reader plugs into the audio jack of your iPhone, iPad or any Android Device. If you are using an iPhone or an iPad, then the card reader can be disabled from the General settings to access the audio jack for music. To use the Swipe card readers supported by Shopify, you will need to have Shopify Payments or a POS supported payment provider enabled. Your POS device needs an internet connection to use the Swipe card reader, either using Wifi or the device’s cellular data. 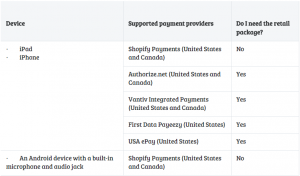 The Swipe card reader can be purchased only from the Shopify Hardware Store in Canada. The card reader won’t be detected if the device volume is not set to maximum.